In his post entitled, “Employee Engagement Isn’t Getting Better,” Mark observes that engagement really hasn’t changed much since Gallup began tracking it well over a decade ago. In an interview with Gallup’s Dr. Jim Harter, the company’s engagement research leader, the main reason given is that executives at most companies believe their own engagement scores are good enough, and that the key to increasing engagement scores is training of leadership at the front lines and flex-time, “not perks,” which were found by Gallup to have little impact by themselves. We at the Enterprise Engagement Alliance agree, but we also believe that there’s much more to driving performance through engagement than just good leadership and flex-time. To achieve ROI from any human capital initiative, be it for a customer, distribution partner, employee, or community, requires a fully-integrated campaign that addresses all of the levers of engagement, including emotion, capability, task value, feedback, etc. In Mark’s article, Gallup admits that companies that use its leadership training still fall short of ideals. The reason is that leadership training is not enough by itself. 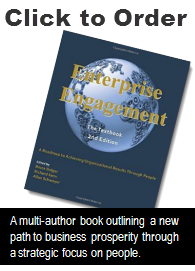 Also, stay tuned for the release of Enterprise Engagement: The Roadmap, the renamed and updated 2016 edition of Enterprise Engagement: The Textbook.